​The tradition of Welsh male voice choirs grew up out of mining, industrial and religious heritage. Music that is soulful, virile and powerful, yet sensitive and moving. ​Monmouth male voice choir seeks to uphold that tradition. The Choir was formed in 2012 by a small group of men under the direction of Aneirin Hughes. It is now a registered charity and has around 50 members. The choir has achieved great things during its short existence, including singing at the Albert Hall, concerts in St David's Hall Cardiff and singing the anthems on the pitch at Wales v Scotland match in 2016. In addition to these major events, the choir promoted gala concerts in Monmouth and performed at fund raising events for a wide range of good causes. Choir members under the direction of Mike Steer and accompanist David Carr have successfully completed a series of workshops with prisoners at HMP Usk which culminated in a successful and moving concert held in the centre of the prison attended by the Gwent Police and Crime Commissioner Jeff Cuthbert and the Mayor of Usk. The choir enjoyed their weekend in Kensington, singing at the Albert Hall on 13th October 2018. Many thanks to the London Welsh MVC for inviting us to sing at this occasion. It was a magnificent event. The choir performed a selection of traditional Welsh male voice choir music with some connections to America for the American guests of Lakani World Tours on Sunday 3rd September 2018. The grandeur of the setting and the excellent acoustics in the hall made this a very special occasion. Afterwards in the late afternoon sunshine the choir enjoyed a complimentary drink on the terrace - what a great way to spend the evening. "Please thank all the choir for putting on such a fantastic performance. It was incredible." ‘The Regimental Band of the Royal Welsh gave us an incredibly powerful and rousing performance and Monmouth Male Voice Choir just gets better and better’ said High Sheriff, Kevin Thomas. Mr Thomas and his wife Elaine were guests of honour at the Choir’s Charity Gala Concert in aid of ABF – The Soldier’s Charity in the Blake Theatre. The Mayor of Monmouth, Felicity Cotton, David Davies MP and Maj. Gen Lennox Napier also attended. After the tribute the Regimental Band of the Royal Welsh, conducted by Major Denis Burton, played the French Military Band and the Choir sang the well known Welsh hymn ‘I bob un sy’n fyddlon’ followed by the medley of First World War songs. This was followed by the Band playing the Evening Hymn and Last Post. The choir was invited to support the voices of Haberdashers' Monmouth School for Girls to celebrate their 125 anniversary. The chosen piece was Karl Jenkins' "In these Stones Horizons Sing", which introduced us to a new genre of music and the opportunity to sing with a full orchestra and with the massed voices of the school. ​We were joined by members of the Drybrook & District MVC and thoroughly appreciated their support. HMSG’s beloved musical director, Mario Conway, who is retiring this summer after 35 years of loyal service to the school, was given a standing ovation at the end of the show. Monmouth Male Voice Choir gave a special concert to mark St David’s Day at the Hog’s Head in Llanvetherine on Friday 3 March 2017. ‘As a choir we have achieved great deal in the past couple of years having sung at St David’s Hall, on the pitch at the Principality Stadium and a number of local performances for good causes. This concert and hog roast supper in the lovely village of Llanvetherine was another of these events to help local good causes’ said Stuart Baber Secretary of the Monmouth Male Voice Choir (monmouthchoir@yahoo.co.uk). 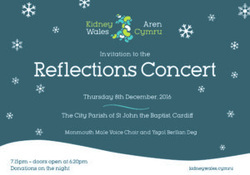 Thursday 8 December at St John the Baptist Church in Cardiff city centre near St Davids' Hall, House of Fraser etc. On 5th November 2016 MMVC performed at the British Legion's Remembrance Concert - combined choirs at St David's Hall, Cardiff. ​Another big event for us, in the company of other great choirs including the Military Wives and Serenata Ladies Choir. The military band was sensational and the rendition of Mansions of the Lord was a real highlight. Monmouth Male Voice Choir sang on the pitch at Cardiff's Principality Stadium before the rugby international between Wales and Scotland 2016. The Choir were selected to perform at the first of this year’s RBS 6 Nations matches in Cardiff by the regular international match conductor Dr Haydn James. The Choir of over forty members performed on the pitch after a gruelling schedule of rehearsals - twice a week. They sang well known favourites to entertain the crowd such as Sospan Fach, Calon Lan and Cwm Rhondda and also Loch Lomond as well as the two national anthems Flower of Scotland and Hen Wlad Fy Nhaddau. ‘To sing before over 70,000 fans and millions watching on TV was an incredible way to start the year and shows that the Choir is going from strength to strength. We may not have been good enough to perform at the Stadium in our boots but we are certainly good enough to perform with our voices’. The choir's singing was lovely and moved my father to tears.He grew up in Morriston with the traditions of Morriston Orpheus Choir .As one of the few Welsh speakers present he wondered at the choice of Myfanwy but since it's one of his favourites he enjoyed it nevertheless.! So many people said how much they enjoyed your singing and it helped make the ceremony special and memorable.Thank you all so very much. On behalf of Llandenny PCC I would like to thank you and the choir for making Friday night's concert such a success. We have had lots of people saying how much they enjoyed themselves and our treasurer is very happy as we will have made at least £600. The choir is a great ambassador for Monmouth and something for the town to be very proud of. Thanks again for coordinating the event and we will hopefully meet again at another concert in the future.